Insane in the membrane: What could possibly possess me to get up at 7:00 on a day off, drive the kids at school and then clean the whole house? I was done by 8:30 so that’s not too bad. But still, hello – I need sleep and if I sleep who cares if the house is dirty-ish? Not me that’s who! I’m a Breville whore: I just had panini sandwiches (Just a fancy way of saying “grilled cheese sandwiches” really) that I made in my Breville panini grill, accompannied by an espresso that I made in my Breville da Roma Espresso machine, after grounding the beans in my Breville grinder. Animal Cross’d: I spent about 8 hours playing yesterday to fix the snow/grass havoc that four players running around in the same town will create if you don’t follow rules put in place by the snow/grass Nazi, aka LovelyWife. Fixing the snow/grass requires me to time travel a day forward, play a bit, quit, repeat ad nauseam. in 8 hours of play I managed to move forward about 50 days. Frakin’ loading times. But now we have semi-decent grass anyways. Journey: I hear that there’s a great Journey tribute band that plays the tri-state area. Doesn’t everybody in the States lives in a tri-state area? It’s not easy being a great buddy: I haven’t seen my friend Peter in ages. Not because we don’t like each other anymore, but because he now works night shifts (15:30 to 00:30) while I’m still on the day schedule. So as this entry publishes, I’m sitting in Montana’s right besides his workplace, waiting for him so we can chat for a bit and catch on on each other’s lives. 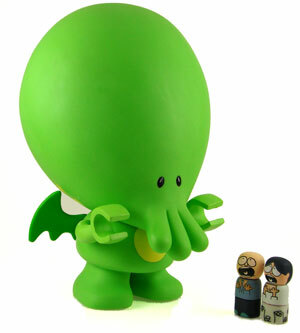 You can buy this adorable “My little Cthulhu“. And it’s out of stock. It’s like “My little pony” but for semi-insane geeks. Except that semi-insane geeks have a lot of money, so it’s gone. Boo.